QED Display Shelving is an innovative totally modular shelving system designed for retail / showroom display, home and office. The QED System can be custom designed to fit anywhere, solving all your storage and display problems. Light but very strong, manufactured from aluminium in a sophisticated range of colours with 5mm glass shelves. 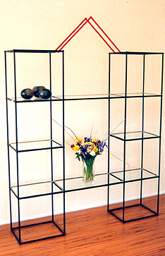 With QED Cube Shelving you can create exciting visual displays for your products. Whether grouped together or standing alone QED Systems range of cube shelving gives you the flexibility to change your displays and promote ongoing visual interest in your merchandise. The strong aluminium frame is available in a range of colours. 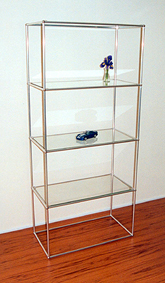 Shelves are 5mm glass with polished edges. Cube Tower size range: 300mm, 350mm, 400mm, 450mm, 500mm and come in various tiered configurations from 1 to 4 tiers. Modular and flexible for creative display options. Range of frame colours available. Illustration at left shows a 4 tier rectangular shelving unit. 720mm wide x 370mm deep x 1620mm high. Other sizes available in 1 to 4 or more tiers. Range of frame colours available. 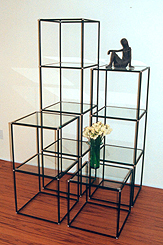 The photo below shows a 4 tier rectangular shelving unit in silver. 1420mm wide x 330mm deep x 1620mm high towers. Range of frame colours available.